Home » What is a Super Lawyer? A Super Lawyer is a distinction that is only granted to roughly two thousand lawyers in the state of Florida. I'm proud to say that I have achieved the Super Lawyer designation in the field of Elder Law since 2008. 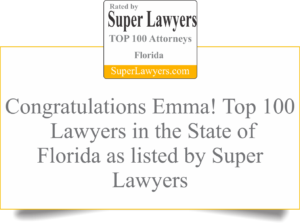 In 2016, Super Lawyer Magazine has also said that i am one of the top 50 women lawyers in the State of Florida.